The Shimabara Rebellion (島原の乱, Shimabara no ran) was an uprising of Japanese peasants, most of them Christians, in 1637–1638 during the Edo period. It was the last major armed conflict in Japan until the end of the Tokugawa shogunate in 1868.After the Battle of Sekigahara in 1600, the Christian lords Konishi Yukinaga and Arima Harunobu were executed and their territories on the Shimabara Peninsula and the Amakusa Islands were given to Matsukura Katsuie (松倉勝家) and Terasawa Katataka. They began to persecute the Christians, and in 1637, oppressed by heavy taxation and suffering from the effects of famine, peasants in the region, supported by dispossessed samurai, revolted. Initially successful, they built fortifications on the site of Hara castle, where they were besieged by more than 125,000 government troops. Eventually the uprising was crushed and all 37,000 rebels were killed after inflicting heavy casualties on their attackers. Suspecting that Portuguese Catholics had been involved in spreading the rebellion, the Tokugawa shogunate evicted all Portuguese from Japan and initiated 200 years of sakoku (isolation from foreign influences), but continued a restricted trade relationship with the Dutch which contributed to their dominance in East Asia. The already existing ban on the Christian religion was stringently enforced, and Christianity in Japan went underground for almost 250 years. After the Jesuit Luis de Almeida began evangelizing there in 1569, many residents of the Amakusa Islands became Christians. 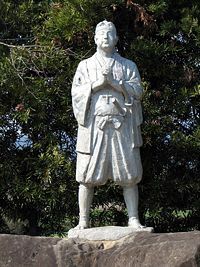 Under the Christian daimyo, Konishi Yukinaga (Don Augustino, 小西 行長, 1555 – 1600), it became a center of missionary activity after the first Jesuit press arrived in Nagasaki in 1590. In 1600, several daimyo from the region opposed the Tokugawa forces in the Battle of Sekigahara and were defeated. Konishi was executed, and the new Tokugawa shogunate placed Amakusa under Terazawa Hirotaka, Governor of Nagasaki. The Shimabara domain which had belonged to Arima Harunobu was awarded to Matsukura Shigemasa (松倉重政, Matsukura Shigemasa, 1574- 1630). The Arima family had been Christian, and many of the local people were also Christian. In 1614, the Tokugawa shogunate began to persecute Christians. The new lord, Matsukura Shigemasa, aspired to a high position in the Tokugawa shogunate and involved himself in various construction projects, including the building and expansion of Edo Castle, as well as a planned invasion of Luzon, the largest island in the Philippines. In 1618, following the Ikkoku-ichijo (一国一城, literally, "One Castle Per Province") policy established by the Tokugawa shogunate, Shigemasa dismantled his two castles at Hara and Hinoe, and began construction of the new Shimabara Castle (also known as Matsutake Castle), on a scale much grander than the domain could afford. To finance all of these undertakings, he imposed heavy taxation on the people of his domain. In a letter describing the Shimabara Rebellion, the Portuguese Jesuit Duarte Correa said that in addition to the ordinary annual tribute of rice, wheat and barley imposed upon farmers, they were forced to pay two other taxes, one on the nono (ninth part) and the other on the canga (for each yoke of oxen? ), and the prime leaves of the better half of each tobacco plant, along with specified numbers of eggplants. They were also obliged to cut wood for the soldiers working in the in salt pans and perform other labor. Wives and daughters of those who failed to pay taxes were punished by being plunged into icy water, and sometimes seized and stripped. The Matsukura clan also began to persecute Christians, and in 1627 began boiling them alive in the infamous Unzen Volcanic Springs. Records kept by the Dutch, who had a trading post nearby and were anti-Catholic, show that they were surprised by the excessive repression of Christians. Shigemasa's heir, Katsuie, continued the repressive policies. The inhabitants of the Amakusa Islands suffered the same sort of persecution at the hands the Terasawa family. The rebels quickly added to their ranks by forcing everyone in the areas they captured to join in the uprising. A charismatic 14-year-old, Amakusa Shirō (天草 四郎, c.1621? - April 12, 1638, also known as Masuda Shirō Tokisada, 益田 時貞) was soon chosen as the rebellion's leader. The rebels laid siege to the Terasawa clan's Tomioka and Hondo castles, but just when the castles were about to fall, armies from the neighboring domains in Kyūshū arrived, and forced them to retreat. The rebels then crossed the Ariake Sea and briefly besieged Matsukura Katsuie's Shimabara Castle, but were again repelled. At this point about 35,000 men, accompanied by women and children, gathered on the site of the dismantled Hara Castle (原城 Hara jō), which had been the castle of the Arima clan before their move to the Nobeoka Domain  They built up palisades using wood from the boats they had used to cross the water, and armed themselves with the weapons, ammunition, and provisions they had plundered from the Matsukura clan's storehouses. Terasawa set out for Shimabara on January 2, 1638, accompanied by a force of 500 of his men and 800 men from Hizen, and set up camp near Shimabara castle to await reinforcements from the court. 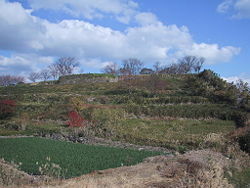 The rebels defended the Hara fortress, 24 miles from Shimabara castle but within sight across the plain. "Are there no longer courageous soldiers in the realm to do combat with us, and weren't they ashamed to have called in the assistance of foreigners against our small contingent?" Itakura Shigemasa was killed in an assault on the castle. Itakura's replacement, Matsudaira Nobutsuna (松平信綱), soon arrived with more shogunate troops. The rebels at Hara Castle resisted the siege for months, causing heavy losses to the Tokugawa shogunate’s forces. Both sides had difficulty fighting in winter conditions. According to Correa’s report, the attacking forces suffered so many casualties from exposure to winter cold that the roads and fields were full of dead bodies. On February 3, 1638, a rebel raid killed 2000 warriors from the Hizen Domain (佐賀藩, Saga-han). Altogether, Hizen lost more than 8000 warriors. Despite this minor victory, the rebels were slowly running out of food, ammunition and other provisions. In February, 1638, several defectors reported that only 70 days of provisions remained in the main fortress and that the outer defenses lacked provisions. In March, the government began assembling forces in Shimabara. By the beginning of April, 27,000 rebels faced almost 130,000 government troops: 30,000 from Chikuzen, 40,000 from Higo; 25,000 from Chikugo, 2,700 from Bungo, 3,000 from Amakusa, 5,000 from Omura, 3,000 from Hirado, and 500 men belonging to the lord of Shimabara.. On April 4, the rebels, faced with the prospect of starvation, launched a nocturnal assault in which they lost 380 men. Captured prisoners and Yamada Uemonsaku, said to be the sole traitor on the rebel side, revealed that the rebels had no food, powder or cannon balls remaining. On April 12, 1638, troops under the command of the Kuroda clan of Hizen stormed the fortress and captured the outer defenses, and the rebels were reduced to defending themselves by flinging their cooking pots at their attackers. A moat around the castle, 34 feet deep and 80 feet wide, filled with the bodies of the dead and the living. The rebels continued to hold out and caused heavy casualties until they were routed on April 15. Statues of Jizō beheaded by rebelling Christians. According to Correa’s narrative, after the victory the government forces decapitated between 35,000 and 37,000 men, women and children and placed their heads around the field. Many of the victims wore rich clothes and swords indicating that they were of noble blood. The number of casualties from the government forces was estimated to be double that of the rebels. From the window of his prison along the road from Shimabara, Correa saw many servants weeping for their dead masters, and countless wounded being carried on stretchers. Amakusa Shirō was captured and decapitated by a soldier under the lord of Higo and his severed head was taken to Nagasaki for public display. The entire complex at Hara Castle was burned to the ground and buried together with the bodies of all the dead. The lands of Arima and Amakusa together were divided among various lords. The lords of Nagato, Arima and Shimabara were held responsible for the uprising and beheaded. Clans which had provided military assistance were excused from the building contributions which the Tokugawa shogunate routinely required from various domains. Matsukura Katsuie was allowed to commit hara-kiri (honorable suicide), and his domain was given to another lord, Kōriki Tadafusa (高力忠房). The Terazawa clan remained in power, but died out almost ten years later because Terazawa Katataka had no heir.The Shimabara Rebellion was the last large-scale armed conflict in Japan until the Tokugawa shogunate ended with the Meiji Restoration in 1868. The shogunate suspected that Western Catholics had been involved in spreading the rebellion and drove Portuguese traders out of the country. In the spring of 1639, Portuguese ships were formally forbidden to come to Japan, while all Portuguese and all children of mixed racial parentage were ordered out of the country. The last Portuguese remaining in Japan left for Macau at the end of October, 1939. A joint Chinese-Portuguese embassy sent to Japan in 1940 was rejected and 61 of its emissaries were executed; only 13 returned to Macau. This episode removed Japan from participation in the tributary-trade system of Ming China. The Tokugawa shogunate initiated a policy of sakoku (seclusion from foreign influences) but continued a restricted trade relationship with the Dutch which contributed to their dominance in East Asia. The already existing ban on the Christian religion was stringently enforced, and Christianity in Japan went underground for almost 250 years. On the Shimabara peninsula, the population of most towns was decimated or entirely wiped out. Immigrants were brought from other areas across Japan to resettle the land and cultivate the rice fields and other crops. All inhabitants were registered with local temples, whose priests were required to vouch for their members' religious affiliation. Buddhism was strongly promoted in the area, and certain customs were introduced which remain unique to the area today. Towns on the Shimabara peninsula continue to have a varied mix of dialects due to the mass immigration from other parts of Japan. In history and contemporary folklore, the Shimabara Rebellion of 1637-1638 has often been cast as a heroic Christian uprising against the despotism of the Tokugawa shogunate. However, the rebellion took place within a much larger political context reflecting the complexity of Japan’s position in the world at that time. Even while the rebellion was occurring, both Japanese and European authorities were debating whether its real cause was religious or economic. Toyotomi Hideyoshi, who had unified Japan in 1590, formed his five most powerful lords into a Council of Five Elders before his death in 1598, to rule over Japan until his infant son was old enough to take over. Soon after his death, one of these daimyo, Tokugawa Ieyasu, began consolidating his own political power. Toyotomi loyalists, including Konishi Yukinaga, formed an alliance against Tokugawa but were defeated in the Battle of Sekigahara in 1600. Tokugawa then punished or exiled them and redistributed their lands and fiefs to those who had assisted him. Many local samurai and former retainers were suddenly dispossessed, and the peasants were subjected to harsh treatment by new lords to whom they felt no loyalty, and who spent much of their time far away in the Edo court. Oppressed by the heavy taxes imposed by the Tokugawa shogunate, and suffering from famine, the local people felt deep resentment and anger. The Tokugawa shogunate was aware that Portugal, Spain and the Netherlands were vying for trade with Japan, and even for control over Japan. The Portuguese had already made inroads through Jesuit missionaries who evangelized and won over influential converts. The Dutch strategy was to form alliances and provide military assistance to powerful local rulers who could then supply them with trade goods. The Tokugawa shogunate was planning a joint invasion of Luzon, the largest island in the Spanish Philippines, with the Dutch (who abandoned the plan after observing the disorganization of the shogunate forces during the Shimbara Rebellion). The Calvinist Dutch were anxious to displace their Portuguese rivals and may have encouraged Tokugawa to view the Catholics as a threat. Since many of the participants in the Shimabara Rebellion were Catholic Christians, the Tokugawa government had a pretext to completely eliminate Christianity from Japan. The idea of a Christian uprising also appealed to European Christians, who saw it as symbolic of the success of their evangelization. There is no doubt that many of the participants in the Shimabara Rebellion were Christian, but their motivation is unclear. Duarte Correa, a Jesuit imprisoned in Omura in 1937 and bound to the stake and "roasted" in August, 1639, apparently collected information during the Shimabara Rebellion from various Japanese informants and wrote a letter from prison to his superiors which was published in Alemquer, Portugal in 1643. Some of his informants believed the rebellion in Amakusa started because Christians were being persecuted, and others attributed it to famine and economic conditions. The rebels may have hoped to carve out their own domain on the Shimabara peninsula, or simply wished to avenge themselves on their oppressors. Correa concluded that the local lords represented the rebellion as primarily a religious uprising to disguise their own greed and failure from the Tokugawa government. Whatever its original causes were, the rebellion soon took on a religious character. Correa’s informants told him that the rebels in Amakusa shouted the names of Jesus and Mary at the enemy, and carried banners with Portuguese inscriptions such as "Louvada seia o Santissimo Sacramento" (Praised be the most Holy Sacrament) and "San Tiago." The instigators of the Shimabara rebellion promoted Amakusa Shirō, the youth who was made their leader, as the "Fourth Son of Heaven," whom the Jesuit missionary, Saint Francis Xavier, had prophesied would lead the Christianization of Japan. The head of the Dutch trading station, Nicholas Koeckebacker, reported that the Christians of Arima (Shimabara) allied themselves with the rebels of Amakusa and replaced Japanese religious symbols with Christian emblems. Once they had begun their uprising, the rebels knew that there was no turning back and that they had no choice but to fight to the death, because the Tokugawa shogunate would show no leniency. Total size of rebel forces: Estimated between 27,000 and 37,000. ↑ W. Scott Morton. Japan: its history and culture. (New York: McGraw-Hill, 1994. ISBN 0070434239), 260. ↑ Hugh Borton. Japan's Modern Century. (New York: The Ronald Press Company. 1955), 18. ↑ David Murray. Japan. (New York: G.P. Putnam's Sons, 1905), 258-259. ↑ Geoffrey C. Gunn, The Duarte Correa Manuscript and the Shimabara Rebellion, in CROSSROADS, University of Washington. Retrieved September 6, 2008. ↑ Gunn, "The Duarte Correa Manuscript and the Shimabara Rebellion," in CROSSROADS: A JOURNAL OF NAGASAKI HISTORY AND CULTURE, 6 (Autumn 1998) edited by Lane Earns and Brian Burke-Gaffney. online, CROSSROADS.University of Washington. (in English) Retrieved December 15, 2008. ↑ Nihon no Meijōshū, 168-169. ↑ Naramoto, 397; Noel Perrin. Giving up the gun: Japan's reversion to the sword, 1543-1879. (Boston: D.R. Godine. 1979. ISBN 0879232781), 65. ↑ Victor Harris, "Introduction" to Musashi Miyamoto and Victor Harris. A Book of Five Rings. (New York: Overlook Press, 1974. ISBN 0879510188), 18. ↑ Thomas Benfield Harbottle. Dictionary of battles, from the earliest date to the present time. (Detroit: Republished by Gale Research Co. 1966), 13. ↑ Harold Bolitho. Treasures Among Men; the Fudai Daimyo in Tokugawa Japan. (New Haven: Yale University Press, 1974. ISBN 0300016557), 105. ↑ Karatsu domain on "Edo 300 HTML" Retrieved September 7, 2008. ↑ Robert Neelly Bellah. Tokugawa religion; the values of pre-industrial Japan. (Glencoe, IL: Free Press. 1957), 51. ↑ Adapted from Naramoto, 399. Numbers as per Japanese Wikipedia entry. Retrieved September 17, 2008. Bellah, Robert Neelly. Tokugawa religion; the values of pre-industrial Japan. Glencoe, IL: Free Press. 1957. Bolitho, Harold.Treasures Among Men; the Fudai Daimyo in Tokugawa Japan. New Haven: Yale University Press. 1974. ISBN 0300016557. Borton, Hugh. Japan's Modern Century. New York: The Ronald Press Company. 1955. Doeff, Hendrik, and Annick M. Doeff. 2003. Recollections of Japan. Victoria, B.C. : Trafford. 2003. ISBN 1553958497. Harbottle, Thomas Benfield. Dictionary of battles, from the earliest date to the present time. London: Swan Sonnenschein & Co. Ltd.. Detroit: Republished by Gale Research Co. 1966. Miyamoto, Musashi, and Victor Harris. 1974. A book of five rings. New York: Overlook Press. 1974. ISBN 0879510188. Morris, Ivan. The nobility of failure: tragic heroes in the history of Japan. New York: Holt, Rinehart and Winston. 1975. ISBN 003010811X. Morton, W. Scott. Japan: its history and culture. New York: McGraw-Hill, 1994. ISBN 0070434239. Murray, David Japan. New York: G.P. Putnam's Sons. 1905. Naramoto Tatsuya. Nihon no kassen: monoshiri jiten. Tokyo: Shufu to Seikatsusha. 1994. Nihon meijōshū. Tokyo: Gakken, 2001. Perrin, Noel. Giving up the gun: Japan's reversion to the sword, 1543-1879. Boston: D.R. Godine. 1979. ISBN 0879232781. Sukeno, Kentarō. Shimabara no Ran. Tokyo: Azuma Shuppan. 1967. Toda, Toshio. Amakusa, Shimabara no ran: Hosokawa-han shiryō ni yoru. Tokyo: Shin Jinbutsu Ōraisha. 1988. This page was last modified on 14 September 2015, at 16:15.